winner chosen by random.org and announced later this week. oh so adorable. thanks for introducing us. i checked out the shop and i love the "home is wherever i'm with you". perfect for my hallway! I love rise and shine hoop! I now like Take the Cannoli on FB. Just tweeted- can you tell I really want to win?! lovely. lovely shop. Stuff that makes my heart feel happy! I follow her on twitter. We're twitterpated. I adore the "I love you to the Moon and back" hoop. This would look so pretty in a nursery! YOu are beautiful! Such a sweet hoop! Would look great in my craft room. after moving around like a nomade for all of our marriage, i love anything that reminds me that my home (no matter where it may be) is with my hubs and baby girl. i love the "home is wherever i'm with you" stitch. hoping i win! i subscribed to nat's blog! i "liked" take the cannoli. The glory glory hallelujah one is so perfect for my bare wall right now... it is the cutest thing I've seen in awhile! I love the "great is thy faithfulness"!! awesome! You are Beautiful is my Fav! this brightens up my busy Tuesday! i love "great is thy faithfulness"
I love Nat's blog & shop! I love her "Glory Glory" & "Great Is Thy Faithfulness" hoops! I love you to the moon and back is just ONE of my favorites. Oh, my goodness! Do I have to pick just one that I love?? I have a deep infatuation with hand stitched hoops....I love the "love you to the moon and back" and the "glory glory hallelujah" and the "rise and shine" and...and....ha! I am now following Nat's blog! I'm following Nat on Twitter now. 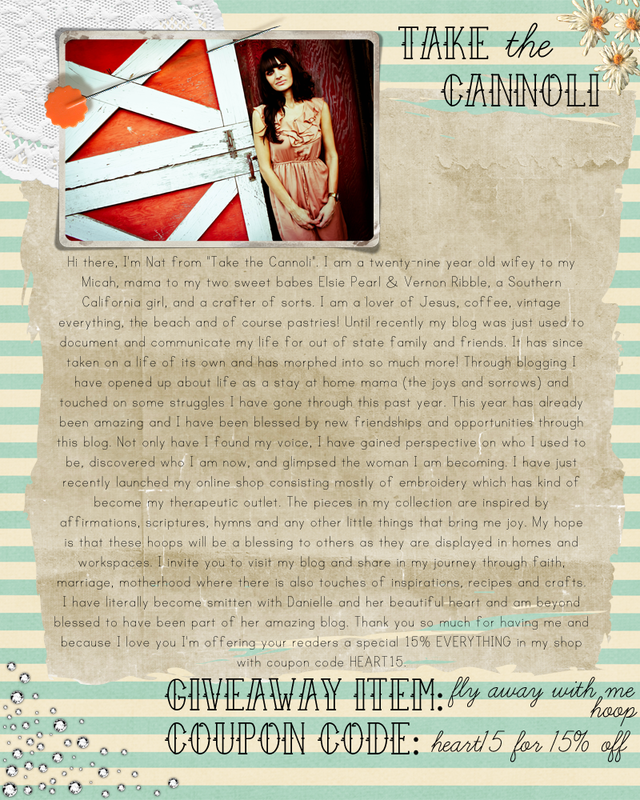 I liked Take the Cannoli on Facebook! Those hoops are so sweet!! Just lovely! Thanks for the opportunity to enter! I love the love you to the moon and back or glory glory hallelujah - not sure I could ever walk past that without singing just a little bit in my head (or out loud)!! LOVE the oh happy day embroidery hoop--soo cute!! I love Natalie!! and her shop. I love the "I am my beloveds and he is mine" hoop. And all the rest of them! So many favorites in her shop! I love the "How Great Though Art", the "Seashore Love", the "Great is thy Faithfulness" and the felt bow garland!!! 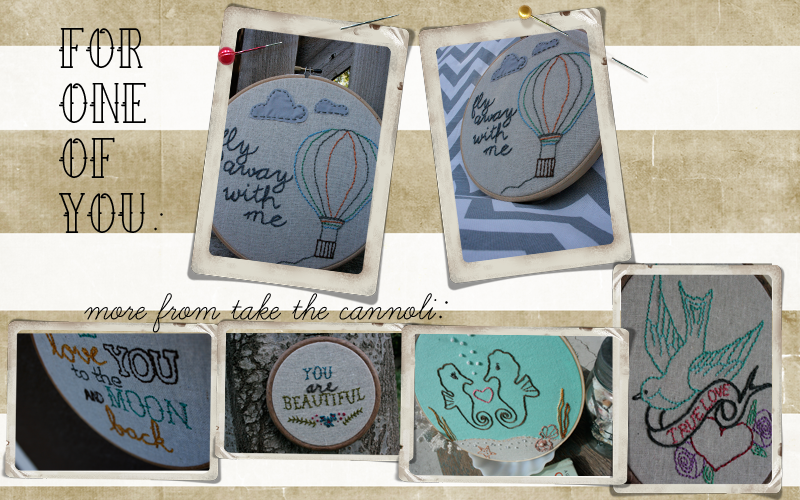 I love the "smitten with you" hoop! adorable shop!!! i love both of your blogs! That's such a sweet sentiment! Thanks for offering this giveaway! so many adorbs hoops to envy! i love the following: "i love you to the moon" "rise and shine" and "then sings my soul"
totes follow her blog now! i liked on facebook baby! I love it!! Now i have another blog I have to keep up with. Thanks! What a beautiful prize, thanks for the chance to win! My favourite item is the 'Happily Ever After' hoop. I now follow Take the Cannoli with Google Reader.